There are two faerie door models provided, one intended to show how the faerie door appears in the fae world, and the other showing how it manifests itself in our world. In Superfly, raise mesh light samples to 15-25. For the Firefly IDL version, render with IDL engaged, giving both irradiance caching and indirect light quality 67% or better. The "fae side" version should load with a point light already positioned and parented within the bioluminescent globe. The door opens with Y-rot; max is about 125 degrees, beyond that you hit leaves/branches, or the statue's knee. 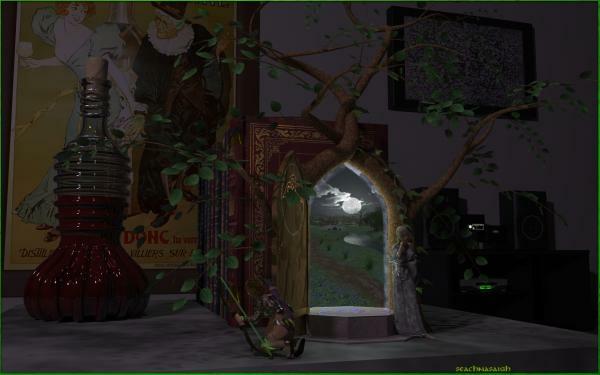 Just replace the image map in the material room to change the faerie world from night to day, or use the MT5 in the materials\Faerie Door library. There are also MC6 to texture dolls as statues (Aiko 3, Dawn, Roxie, and V4.2). If you have CR2 hair or clothes on the statue doll, you'll need to scale those figures up to match. This should work with Firefly IDL self-illumination in P9/Pro2012 and later. It will probably work in P5+ albeit you'll need to use Poser lights for illumination effects. Free for both personal and commercial renders; do not redistribute. ofuhunter (1 year ago) Inappropriate? Milos Gulan (1 year ago) Inappropriate? Thank You so much, it looks great! @Perpetual Revision, Elfwine, manikineko, Ivy, et al, thank you for the kind words! @Shante: The statues are included. They are separate props from the rest of the faerie door model, so that you can delete them. I included statue poses for A3, V4.2, Roxie, and Dawn, and material files, so that you can use them for statues if you wish. shante (1 year ago) Inappropriate? beautiful offering, THANKS. Are the stone figures either side of the doorway part of the product or something else? They look great with the doorway! Perpetual Revision (1 year ago) Inappropriate? This is perfect for the Fairyland project I'm working on! I just played with an older faerie door of yours yesterday (as well as some elven furniture), and I'm always amazed at the quality of your work. THANK YOU so much for everything you've shared!! OrishaShango (1 year ago) Inappropriate? azoohouse (1 year ago) Inappropriate?